Once, long ago and far away, there lived an itinerant rabbi named Mottel, not to be confused with Mattel, which makes toys. Mottel was a very learned but arrogant rabbi who had once had a pulpit in a well-to-do synagogue in Minsk known as Temple Beth Cooper. He was famed throughout the land for having written the popular Cliff’s Notes to the Talmud and an unauthorized biography of G-d entitled Sure I’ve Made Mistakes, What’s It To Ya? Everything was going quite well until one day, sadly and unexpectedly, Mottel lost his pulpit --- most likely in the dryer along with the socks. Realizing that anything lost in the dryer could never again be found, Mottel packed up his books, left Temple Beth Cooper, and filed for unemployment, which back in those days considering the cost of living of living and with the Republicans in office and carry the 4 then multiply by 15 amounted to NOT A DAMN THING! “My G-d, this is fun for you? !” railed Mottel at the Supreme Being. Fortunately G-d didn’t rail back, because that would have brought a dramatic and swift end to our little story, folks, period, finito! Mottel went to the rabbi temp agency in town but had little success because the rabbi temp agency performed background checks, did drug testing, and refused to hire Jews. 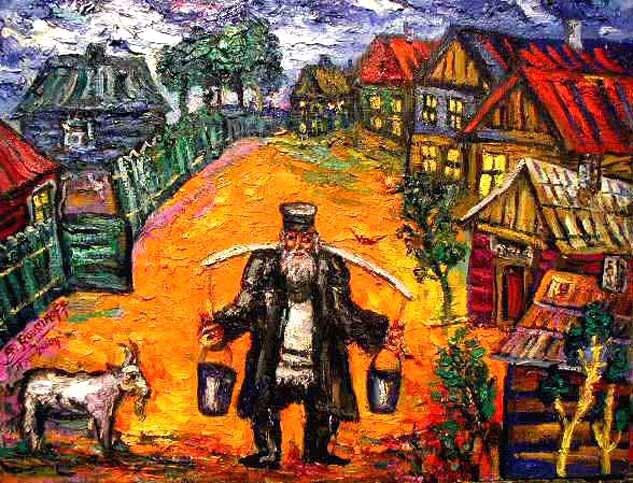 So Mottel began traveling the countryside seeking rabbi temp work. He would doven for dimes, pray for pennies, and petition the Lord with prayer because he was also a Doors fan as well as a rabbi. And so Mottel the Arrogant became known as the Mottel, the Itinerant Rabbi. As he would enter each new village, Mottel would offer the townspeople the opportunity to ask him three questions about Judaism or about problems they needed solved in their daily lives. The only restriction he imposed was that his responses need not be in the form of a question. If Mottel were able to deliver the correct and/or helpful answers to the townspeople, they would provide him with a warm place to sleep and all the cheesecake he could eat for one entire week. If he would fail, Mottel would promptly leave the village while the most musically talented of the villagers would take a horned instrument and play the wah-wah sound. Mottel was particularly famished one afternoon as he entered the village of Krackcorn. He had not eaten in several days because at his last village he had failed to help a poor farmer who had come to him with the perplexing problem of a chicken which would not cluck or lay eggs. Mottel had suggested that the farmer move the chicken out of the coop and into the main house with the farmer and his wife. Sure enough, soon the farmer began laying eggs and clucking while the chicken married the farmer’s wife and went on to a brilliant career in the State Department. An intriguing result to be sure, but not the one desired or requested! Mottel walked straight to the Krackcorn village square and announced himself to the villagers. Soon three humble men from the village approached, and the first of the three walked up to him. Although shame-faced at the manner in which he had been spoken to, the first man nodded satisfaction with the answer, thanked the Itinerant Rabbi, and went back to his home. “That’s one down and two to go, Mr. Cerf?” said Mottel to himself, knowing full well that only older Baby Boomers would get that joke. He was tasting the borscht and sour cream already. The second man approached Mottel. The third man now walked up to Mottel, but he had a question of a wholly different nature. "Rebbe,” said the third man with more authority in his voice than the other two men could ever have mustered, “I have a daughter who, frankly, puts the mees in meeskeit. I cannot find her a husband because she has a face that could cause Moses to part the Red Sea just to get away." “That bad?” replied Mottel, a bit crestfallen. Mottel took a look and yes, he had to agree that she was the tallest. “How will I ever solve this problem?” he wondered as he began to sense the cheesecake, brisket, and borscht he so desired evaporating into thin air. And so he began to think very hard. Mottel’s heart sank so deeply and completely that he realized one day James Cameron would make a movie about it. He thought about food and his stomach grumbled. He looked at Meeskela and his stomach turned. But a stomach divided against itself cannot stand, and so as he stood face to face with the third man, the Itinerant Rabbi made an unexpected decision. “I will marry Meeskela,” Mottel announced. At that, the third man wept, hugged Mottel, and lifted him onto his back to carry him to his humble home. As Mottel was lifted high in the air like a Jewish groom, which of course he was, he began to wonder if the decision he had made would one day by comparison make the townspeople of Chelm look like rocket scientists, which would be no mean feat because even the rocket scientists in Chelm were no rocket scientists. Nevertheless that very evening, Mottel was treated to a fine dinner which included borscht and sour cream, brisket, and all the cheesecake he could eat. And he stayed in the humble home of the third man, his wife, and Meeskela for an entire week, during which time he married Meeskela. And then, a great miracle happened! At first, Mottel needed a good stiff drink each evening to even look at Meeskela. But then he noticed something: Meeskela was kind, patient, and warm. She looked after Mottel’s needs. She did for him and cared for him and asked nothing in return. And Mottel gradually came to realize that on a good day, from a certain angle, when the sun was shining so brightly that there no longer seemed to be any trouble or heartache in the world, Meeskela didn’t look half-bad! Soon Mottel’s arrogance faded away. He became kind and good to all the people of Krackcorn. When the village rabbi passed away (under very suspicious circumstances, I might add) Mottel became the next village rabbi. And he turned out to be a very good rabbi indeed, beloved throughout the village as well as throughout the greater metropolitan village area. One day Mottel realized that he loved Meeskela very much and would stay with her always. Besides, no one outside of New York City made cheesecake any better! And so, Mottel the Itinerant Rabbi was no longer an itinerant rabbi at all. Because in the little village of Krackcorn, Mottel had found a home. But perhaps more importantly --- yes, much more importantly --- the once Itinerant Rabbi, the learned but arrogant rabbi Mottel, had also found his heart. *Old Jewish Folk Tale - as told by an old Jewish folk. Me. Doven - to recite Jewish prayers while swaying. Has nothing to do with "I want a Doven Bar!" Meeskeit - an unattractive person. Sort of like your cousin Edwina. Chelm - village in Jewish folklore where all the people are idiots and fools. Sort of like lots of people in your family. I wasn't sure how this story would be received --- so far, you are the only one to receive it --- because it's unusal for me to actually tell a story and to do so in another genre (I did it once before). I also hope the Jewishisms weren't too mystifying. I've included more footnotes here than I have in anything I've written since college! Thanks again. Enjoying your regular posts too! Funny, but I for one would have liked a different ending - more like the fractured fairy tale that it was. You know happy endings are against the Jewish religion. There was one verb that was plural that should have been singular. That hurt me. You have some funny notions and delivery. Thanks for the footnotes because being Sephardic I don't know any Yiddish. Perry, you are an original! Your humorous voice wins the day. Thanks for sharing...I will pass this one along to my Reform friends. Keep writing! Well, I haven't heard from you since I presented you with the coveted Versatile Blogger Award a while back. Yes, I understand you've been on the West Coast partying with film stars, but you might pick up a phone once in a while. Or at least answered the phone when I called! I went for a serious ending mainly because the piece seemed to call for it. I couldn't leave poor Meeskela without a husband or the poor rabbi starving, even though he was sort of a jerk. Also I thought it was time to get away from all the anachronisms. Okay, Miss Francis? What is the plural that should be singular? It's hurting me! Please tell me so I can fix it! I appreciate your passing the story on to your Reform friends and not your ultra-Orthodox ones. I just felt the heroine's name was unusual. I would have gone for something more like Shayndel or Frummie. Hail to the Tag Team!